Now a days with out Food Processors you can’t imagine a Kitchen. It has become one of essential things in kitchen which make food processing easly and fast. Food Processors comes in two types, one is manual operated another type is electric motor driven food processor. While you are in market to buy good food processor, there are many things you have to look into. One of the thing is it should be a good brand. Apart from good brand you also have to check other important things like Capactiy of Processor Container, Size of Feed Tube, Attachments & Accessories, Motor Power and Warranty. Capacity is one of the major factor while you are looking to buy a food processor which will help you to make food for more number of people, This factor always matters whether your family is small or big because when you have guests you need to process food for more number of people. On the other hand if you have small family or you don’t need to process food for more number of people, then it is better to choose the food processor with smaller capacity. 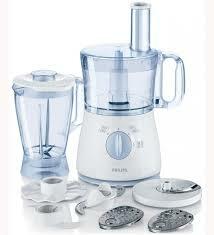 Check about capacity of Processor before you buy any Food Processor. Capacity of Food Processor is mesured in Cups or Liters. Feed Tube is important part of Food Processor where Fruits/Vegetables are kept to process them, It always better to have large size Feed Tube, so it will help you to cut down preparation time before you process the food. Small Feed Tube Size Processors require small pieces compare to larger size Feed Tube. Yes, it is one of major factor while choosing best food processor for your kitchen, before you choose food processor look into the product details and what accessories & attachements are provided. It is better to have Slicing Accessory, Chopping Accessory, Shredding Accesory, Mixing Blades and Dough Blades. In general you will find Food Processor with power of 500 Watts to 1200 Watts, you can make more quantity and varaties of food if you have more powerful food processor. On the other hand power consumption will more in 1200 Watts Food Processor. It is always better to have good warranty cover for any Electircal Product as you need not worry when something goes wrong. In general better to choose Food Processor which will come with 3+ Years Warrany. These are the major factor before you choosing food processor, which will help you to be happy with your food processor in kitchen.